I just came back from a trip to Boston. While I was there I picked up some local beers to bring home that I’ll be reviewing over the next few weeks. One brewery I was very much looking forward to trying was Jack’s Abby, a brewery located in Framingham, MA that specializes in lagers (for anyone unsure about the difference between an ale and a lager check out my post “A Few Beer Basics”). I’ve read some glowing reviews of their beers like Jabby Brau, Hoponius Union and Kiwi Rising. When I went to the beer stores in Boston I found Hoponius Union in a 6-pack, while the other two came in 16 oz bottles. Since I had to bring the beer back in my luggage this was the rare occasion where the larger single bottle was preferable to the 6-pack, so I brought back one bottle each of Jabby Brau and Kiwi Rising. 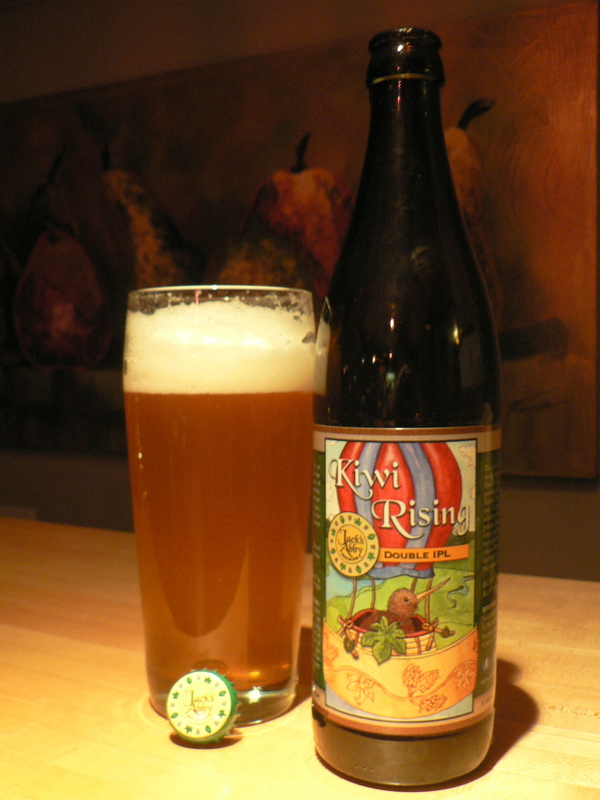 Kiwi Rising is an unusual beer on several fronts. India Pale lager is a relatively new style that uses lager yeast and cold fermentation, with hop varieties and amounts that are typically used for IPAs. IPLs are relatively uncommon, and double IPLs are quite rare. To back up its claim to be called a double IPL, Kiwi Rising is 8.5% abv and 105 IBUs. Conventional thinking is that humans ability to taste bitterness saturates above 100 IBU, so this beer is effectively as hoppy as you can get. The other twist here is the use of New Zealand hops, which are increasingly showing up in American craft beers. Nonetheless, the number of beers that showcase New Zealand hops is still a tiny fraction of the market. Exactly which varieties of New Zealand hops are used Kiwi Rising is not disclosed. The brewer has this to say on the bottle. There is a huge amount of carbonation on this beer. On pouring the head filled up about 80% of the glass. After the head finally settled, leaving behind an intricate concentric ring pattern of lacing, the beer was a cloudy pale yellow color. The aroma is definitely hoppy, and the taste follows the nose closely, but the New Zealand hops smell and taste very different from their American and European counterparts. I spent some time trying to put the taste into words. The first adjective that comes to mind is catty (as in cat piss). Believe it or not this is a taste descriptor that you find in some beer reviews, usually followed by a disclaimer to say that it’s such not a bad thing. Call me simple minded but I find the combination of “tastes like cat pee” and “in a good way” to be oxymoronic. Not content with that descriptor I kept trying to find a better way to describe the taste. There is some citrus fruitiness to it, along with something akin to pine, but maybe a little closer to juniper. These two flavors are mixed with a healthy dose of onion/garlic, a taste that might be OK in small doses (Summit hops are supposed to give onion/garlic notes) but here it is far too pronounced for my tastes. Once I recognized the onion/garlic flavor it was unmistakable, and I think the onion-pine-citrus combination is a much better descriptor than catty. Everything about this beer was spot on for a double IPA (and hence appropriate for a double IPL in my book)—great appearance and head retention, nice slightly oily mouthfeel, aromatic and intensely hoppy. It’s a showcase for the New Zealand hops, but the problem for me is that I’m not a fan of the hops used in this beer. I’ve tried a few different beers with New Zealand hops now (Superconductor by 8 Wired, Nelson Imperial IPA by Widmer) and I haven’t been crazy any of them. I guess their flavor profile is just not for me. As much as I wanted to like this beer I couldn’t. In retrospect I should have picked up the Hoponius Union. Great review, I’m very keen to try Kiwi rising so will need to see where to buy in Melbourne. I’m a kiwi living in Melbourne, and would love more beers to use Kiwi hops. I think NZ craft beers punch above their weight especially in Oz – as I keep telling my (Work) mates! They don’t believe me so will need to find a kiwi rising and show them. Glad you liked the review. Unfortunately Jack’s Abbey beers don’t even make it out to Ohio where I live, so it might be pretty tough to track one down in Australia. I did see they are expanding though so who knows. Good luck.